December 28th in Wordpress Plugins by Wordpress Jedi . Here is a handy plugin that lets you create virtual tours for your WordPress site without a complex setup. The MV 360 Tour allows you to upload images and add hotspots through which multimedia content can be viewed or scenes can be changed. 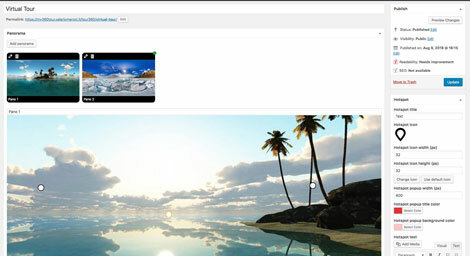 The tours are responsive and can be customized easily. This plugin supports 4 types of hotspots. You can use them to move your viewers from one panorama to another. The MV 360 Tour plugin is ready to be translated. It is compatible with WPBakery Pagebuilder, Divi, and similar plugins. You can find it here.